During this discussion, experts on the panel shared their company’s vision toward building a strong healthcare ecosystem and ensuring quality medicines reach every Indian citizen. 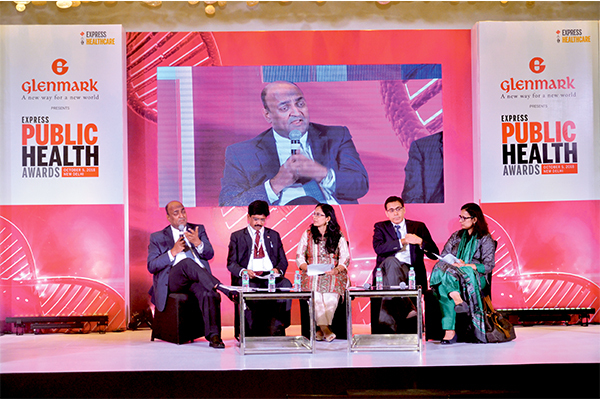 The panelists were N Rajaram, MD, Sanofi India; AG Prasad, VP-Cluster Head, Sales & Marketing, Glenmark Pharma; Viveka Roychowdhury, Editor, Express Healthcare & Express Pharma (moderator); Umang Vohra, MD & Global CEO, Cipla and Anuja Kadian, Head, Government Affairs, AstraZeneca Pharma India. They also deliberated on the challenges they face in doing so. Health is not only the responsibility of the health ministry. It is a social matter and so every industry and every company needs to contribute to health and healthcare, the panelists believed. Organisations should ingrain the philosophy of understanding what is good for the country is good for the company. There is a need for pharma companies to have a social vision within working in public health. The experts also discussed on ways that will ensure quality and efficacy of medicines. Access is not equivalent to affordability, it is much beyond this, it’s like building an ecosystem for healthcare where no citizen is deprived of medical aid, they maintained. Further, the panelists also spoke on the scope of the Ayushman Bharat scheme to strengthen the public health system in India. There is a need for pharma companies to focus on solving India’s health issues, they said. Additionally, they highlighted the need for more investment both by the government and private sector in public health. Access is not necessarily equal to affordability. It is beyond that and involves creating a conducive ecosystem for healthcare. vigilant about the safety and efficacy of their products. Ayushman Bharat is a bold initiative but it should not stop at UHC, cannot be solely driven by cost and should not be just about medicines and hospitalisations but also diagnosis.